Oh. I missed getting a picture of the sunset. It was pretty. I almost said, "looking west..." lol. The sky had clouds on the horizon which turned pink and denim blue, then deepened to apricot and night blue. Even prettier, my Mommy. It's so nice to see her and hold her and hear her. To see her out of that neck contraption. I never posted pictures... too personal and sad, but I am sure you can imagine that seeing her out of the brace and healing so beautifully is an answer to our prayers. She's been staying with Hans, my brother, and his wife Gretchen, and later she'll honor us with a stay at Garage Mahal. And sometime in the middle of her stay, we are all going to be in the mountains! I need to make some more scarves! There may be snow! Gee, did this paragraph have a point? Pretty sunset. Pretty Mommy. Tasty. Yes, I am devoting a paragraph to the salad. Gretchen made this salad and it confirms that I really should consider taking a salad making course. This is not me trying to be hard on myself. I can cook and I have good dishes in my repertoire, but salad is my weakest link. Gretchen's salad was a taste symphony and pretty. There's that word again. This is officially a *pretty* post. Gretchen is pretty and Gretchen's home is pretty and her salad is pretty. It had nuts and peppers and cheese and raisins and leaves and dressing... and it was just so darn tasty. And pretty. The sun set and the light was a bit soft for pictures, but I still have to post this one. Pretty Tutu, coloring with Maria. Ruth and Hans and Gretchen are nearly neighbors now, just minutes away from each other. And Holly and her family are in the same area... and maybe we should seriously consider returning to the old neighborhood. Our Squaremont roots are strong. It was a good evening for Maria. She had 2 grandmas and a doting aunt, all ready to play with her. It was great getting caught up with Gretchen and Hans. They always have adventures and amazing tales to share, and we enjoyed stories from the back trails of Colorado, to Europe and the Middle East, to in home opera concerts and chillin' with Lance Armstrong... nice guy btw. We even spent time rapt in sincere anticipation waiting for their cuckoo clock to cuckoo. Seriously, I love it when simple things are a pleasure, and friends and family gather to appreciate them. Grill Master Hans... actually, I am not sure that is his real ranking... he may be like a rear admiral or a 5 star captain. Point is, and I may have one: He grilled us a mighty fine dinner. I am just sitting her and thinking of all the things I love and admire about my brother. What a nice reverie. Didn't I say this is a *pretty* post? After dinner and before cuckoo time, Gretchen opened up her home salon for her exclusive and best customer. You may recall the last time Maria and Gretchen got together. Manicures are their thing. Gretchen is so patient and enthused. Maria is so patient and enthused! This time she got the 10 20 digit rainbow... ten colors on the fingers and ten colors on the toes! Tiny, tiny digits. It takes a steady hand and a stroke of artistic genius to paint those bitty nail beds. Maria stays perfectly still, and she kept her hands like that, poised and extended, for the rest of the evening. Soap! Gretchen and her soap sister make lovely, fragrant, natural bars of pretty soap. I love the mild, light scents and Geoff does too. He made sure we didn't leave without replenishing our supplies. Gretchen and Joanne are selling at a craft fair next week and Delia is going to join them and sell jewelry. Hopefully we didn't deplete her stock too much when we took full advantage of the family price. Love the orange patchouli! Juniper berry! Rose garden! Enriched lavender! Well, now it is sunrise. A new day. New adventures await. New pretties to enjoy. I hope you have a lovely day. Announcing the arrival of Lady Betty Orpington's very first egg! Everyone sigh and cheer in unison! Did I ever doubt her? Did I ever malign her? Did I ever question her gender, her femininity? Cast away all suspicion and acrimony. She is a hen and worthy of organic greens and broad sun filled meadows, babbling brooks. 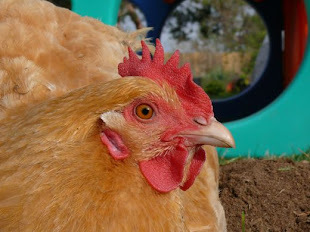 She has been a dear pullet all along. Was there something in her chickness that should have tipped us off? Perhaps. Her tiny brown egg is like cream in coffee. It has a pointy end and is really well formed for a first egg. We are all so amused and delighted. And we are wondering... what do we make with the first egg? What a terrific gathering! Pretty in more ways than just beauty. PRETTY neat to have such a family. PRETTY wonderful to have them gather in one place. Pretty, pretty Maria. Was this the family part of her derpday? She gets prettier every day! So many good things to enjoy... wonderful! How about a soft-boiled egg, the kind that sits in a pretty egg cup and you taptaptap the top and eat it right out of the shell? Congrats to Betty!!! Yay!!! The first egg!!! How egggciting!!! My Miss Betty (the Barred Rock) probably won't lay her first until Feb or March... I'm sure I'll post about it when it happens though. I love how sweet Maria sits so still to have her mani and pedi! Cute!!! Such a girl!!! I remember how exciting the first egg is. Congratulations! Lovely post. Your mother's skin is beautiful btw. When her pic popped up I thought for a second it was my mom. They look very similar. Lovely lovely. Looks like a fun family gathering and I am glad to hear that your mom is healing. Congratulations to Betty on her first egg. May there be many more to follow!! Happy Thanksgiving to you and your family! !